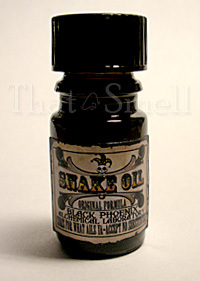 Snake Oil is one of Black Phoenix Alchemy Lab’s most popular fragrances. In fact, I can probably safely venture that it’s the most popular fragrances. Many people love it, and even those who aren’t within the BPAL folds tend to say that there’s something about Snake Oil that makes it special. In Bottle: Here’s the thing about my bottle of Snake Oil. It’s been “aged” for two years so it smells different than a fresh bottle. Mine has a deeper vanillic quality to it, layered on top is an incense like smoke note, a jolt of cinnamon and clove, and a little hint of woods. Applied: A bit of medicinal spice to this, I swear it’s a cinnamon and clove mix with some other spices I can’t identify. There’s a bit of an incense going on, smoking up the fragrance a bit and making the smooth vanilla scent that’s hidden underneath these opening notes. Snake Oil lasts a ridiculous time on me, and I can often wait most of the day for it to turn into something else. But as you keep wearing it, you’ll notice the spices and the smokiness level out a bit and dense, warm, vanilla fragrance will waft up. The vanilla in Snake Oil isn’t your sugary ice cream vanilla scent. It’s got a bit spiciness and sophistication to it. It draws with it a woodsy sort of note that I want to say smells a bit like sandalwood or some other sort of powdery, perfumed wood. The more you let Snake Oil wear on your skin the more vanilla and less spicy it will get until it turns into a lovely creamy, warm vanilla fragrance with a hint of some clove-ladden spice and wood in the background. Extra: So there’s a practice amongst BPAL fans who adore Snake Oil. What you do is get some of the stuff and leave it hanging around for a bit. That’s it. You leave in a dark corner of your fragrance chest, cupboard, drawer, sock, what have you, and pull her out periodically to test. Many people have reported the vanilla becomes stronger and sweeter. If you like the spices and the woods then perhaps “aging” Snake Oil is not up your alley. It’s still an interesting experience to compare a fresh vial of Snake Oil to an older one. Design: Snake Oil, aside from having a fancy label that makes it look like it actually came out of a tonic peddler’s wagon, is bottled in the same amber glass vials as the other Black Phoenix Alchemy Lab scents. Notes: Cinnamon, clove, ylang-ylang, frankincense, amber, sandalwood, vanilla. Please note that I’m only guessing at the notes list above based on what I think I’m smelling in Snake Oil. The official word on the BPAL website says that Snake Oil is “a blend of Indonesian oils and vanilla”. So we at least know for sure there’s vanilla but the rest of the notes list I’ve got is only a guess. Reviewed in This Post: Snake Oil, 2009, 5ml Bottle. This entry was posted in black phoenix, Reviews By House, spicy and tagged amber, cinnamon, clove, frankincense, myrrh, sandalwood, vanilla, ylang-ylang. Bookmark the permalink.